Anybody who is anybody will be in Las Vegas this weekend to witness UFC 168. According to the rumor mill, that includes WWE superstar and former UFC heavyweight champion Brock Lesnar (pictured). Naturally, whenever Lesnar is in the vicinity of an Octagon, rumors spread like wildfire that he wants to return to MMA. So, Dana White. 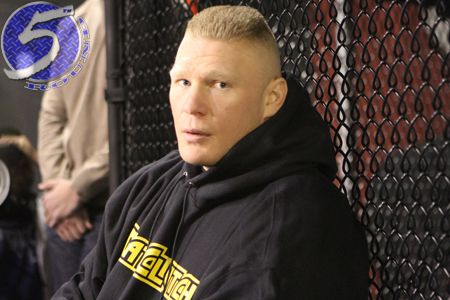 Did you know Lesnar was attending UFC 168, and if so, what’s he doing here? Honestly, honestly? Or honestly, I’m secretly meeting with Lesnar this weekend to discuss a comeback? “Honestly, I don’t know,” White said with a sly grin. Lesnar abruptly retired from MMA after getting steamrolled by Alistair Overeem two years ago at UFC 141. However, the now 36-year-old was mysteriously sitting cageside to watch Junior dos Santos maul Frank Mir at UFC 146, which had many pundits wondering if a comeback was in the cards. “The Next Big Thing” subsequently returned to the WWE, and has been there off-and-on ever since. Lesnar hung up his MMA gloves with a 5-3 professional record, with all but one of his scraps coming inside the big leagues. Four of his seven UFC fights were of the championship variety. With Georges St-Pierre, the UFC’s biggest pay-per-view draw, relinquishing his welterweight title to take an indefinite leave from MMA and the possibility of Anderson Silva calling it quits after Saturday’s rematch with Chris Weidman, Lesnar’s return to the UFC would certainly help fill the void in the star power department.